*Prices are indicative and depend on the current gold price, ring sizes, and the current EURO/DOLLAR exchange rates. Shipping costs included, US and Canadian tax rates excluded. 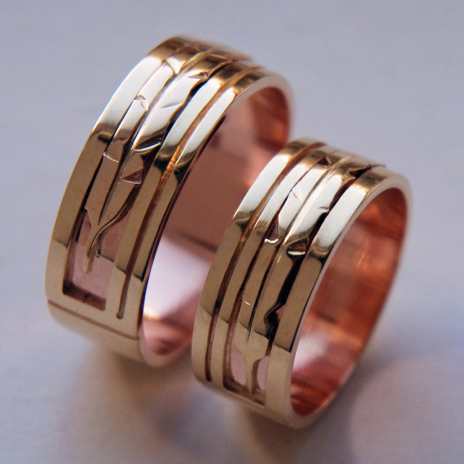 **Prices are indicative and depend on the current gold price and ring sizes. Shipping costs excluded, Dutch BTW included. Please note that persons who hold a Canadian First Nations status card and who live and work on their reserve are generally tax exempt. PLEASE NOTE: The cost of gold, silver, and platinum is fluctuating weekly. Although prices on this website are being updated on a regular base, they are merely indicative. Contact us for a customized price quotation if you find a set of wedding or clan rings or a piece of jewelry you are interested in ordering. Please do not forget to mention the item number and the exact ring sizes in case you ask for a price quotation for wedding rings or clan rings. Since the wider a ring is, the tighter it will fit, please note that your sizes must be measured with a ring sizer (a jeweler's wedding band gauge) of the same width as the rings of your choice. The best size is usually the ring that fits snugly and gives a little resistance when you take it off. If you have additional questions, please do not hesitate to ask. Traditionally, Anishinaabe people have always been aware of an existence in the cosmos that vibrates with a sacred, creative energy. The sum of this cosmological energy, often called ‘‘Great Mystery,’’ finds its symbolic expression in Giizis the Sun, a sacred Sky Entity addressed to as NIMISHOOM, a ‘‘Grandfather,’’ representing life and time in a linear as well as cyclic sense. It is this sacred existence that Zhaawano sought to express in these multicolor gold overlay wedding rings, which he titled MIGIZI MIINAWAA GIIZIS DAANGINIDIWAG (“Touched By The Sun”, or, literally: “The Eagle and the Sun, They Touch Each Other”). 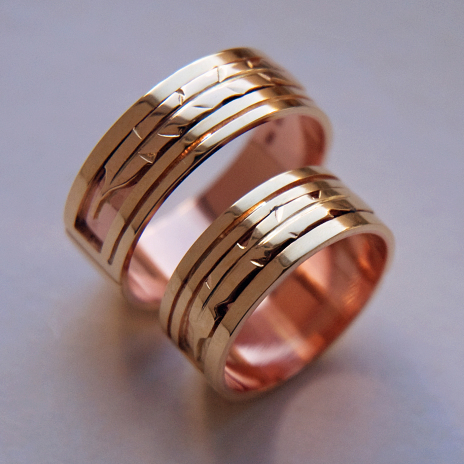 The two-tone wedding rings, which Zhaawano crafted by hand of 14K yellow over red gold and inlaid with a straight-lined, sleekly stylized eagle feather symbol of yellow gold, testify to the beauty of the overlay technique. For more reading please see Zhaawano's Art Blog.